The Steelers were in control throughout because their offense was in control, which meant their quarterback was in control. Ben Roethlisberger completed 26 of 39 for 361 yards and three touchdowns, which was good for a 121.8 passer rating. 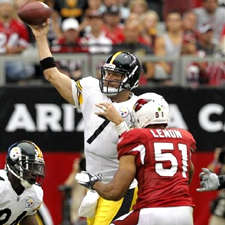 In addition, Roethlisberger engineered scoring drives that answered Cardinals’ scoring drives, which allowed the Steelers to maintain their lead. You can check the post below for more post-game info! Congratulations to Carlee and the Sooners! The Wildcats appeared to be going up two sets to one against Oklahoma Saturday in Norman. However, an eight point run by Oklahoma gave them a victory in the third set and the Wildcats never recovered as they lost the match in four sets. (20-25, 25-20, 22-25, 21-25). In the third set, the Wildcats and Sooners battled, but then a run by the Wildcats gave them a 22-17 lead. The Wildcats were only three points away from winning the match. 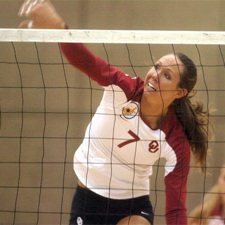 However, Carlee Roethlisberger, the younger sister of Super Bowl quarterback Ben Roethlisberger, had two kills during the run as the Sooners came back for the victory. You can read more about the Sooners’ victory here.